Anybody have any ideas on wiring the kitchen of an existing log home. The counter space is L-shaped with most of the walls being exterior walls. I was thinking of poking through the one little bit of wall that backs onto a framed addition, bringing the wires into a box. and then run EMT from that box to the other receptacles. The EMT can then either be painted by the home owner or even covered with some wood trim. Anybody else have any better ideas? I never thought I'd see the day that I would suggest Wiremold. (I personally don't care for it at all), but it does have its merits. If you use it, it will look cleaner than painted EMT. Usually they drill through the logs in the ones I have looked at. I was always curious how they did it. In most of the log homes that I have seen the kitchen wall has (well concealed) plywood installed so the cabinets have something to mount to that won't settle over time. You could run behind that if it's there. If you're going to use conduit/Wiremold (or even cable) on the log surface you might want to try to get it routed in the groove so it blends in with the chinking when it's painted. They do that while the building is being constructed. This home that I'm working on was built in 1956. They're just a little slow getting it wired. Also, no plywood behind the cabinets... they want to be able to see the logs. My idea was to put the conduit in the groove. 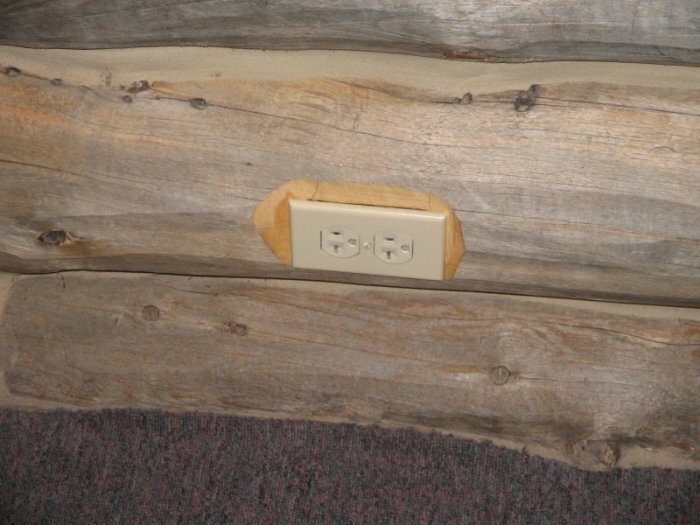 I thought about wiremold, but the logs are round and I don't think that it would work in a groove and it would really stand out on the hump. I also thought about cutting vertical grooves in the logs for the wiring that would be hidden behind the cabinets, but the homeowner doesn't want that. You job is complicated, however, by the uneven faces of the logs. This means either you use Mineralacs to space the pipe off the surface (not a bad idea, as it allows for cleaning), or you rout a groove in the face of the logs. For routing, there is one word: Festo. Quite expensive, the Festo system includes rails that will guide the router independent of the surface of the logs. IMO, a good bed of caulk will suffice to support the pipe; boxes can be screwed to the logs. Even with the fanciest arrangement, you'll still have plenty of hand & chisel work, especially at fittings and bends. For drilling holes, nothing beats an impact driver. The 1/4" hex collet models will make holes to about 1" diameter; Both Milwaukee and Makita make larger models that have a 7/16" hex collet, and will take the 'self -feed' bits for larger holes. When I piped in the lights in my screen cage I fabricated all of the EMT and "tacked" it in place with a few clamps. When I was sure it was right I took it down and painted it. Then when I put it back up it looked great. Just be sure you price all the labor into your job and make sure they will be happy with what you do. I am surprised they are tolerating seeing anything that looks like it came from the 20th century. All of the log cabins I have seen go for the Abraham Lincoln look. How about routing the conduit inside the cabinets and running down (or up) from a j-box wherever an outlet needs to go? That way all that they will see would be the outlet and a few inches of conduit between it and the cabinet. Inside the cabinets MC cable might be easier to work with and just sleeve it with some "woody" material where it runs down the back wall. I brain stormed with my wife on this. She was/is a builder. She says, bring your pipe down in a corner, so they can hide it with a strip of live edge wood and wire in the cabinets with tombstones on the counter.